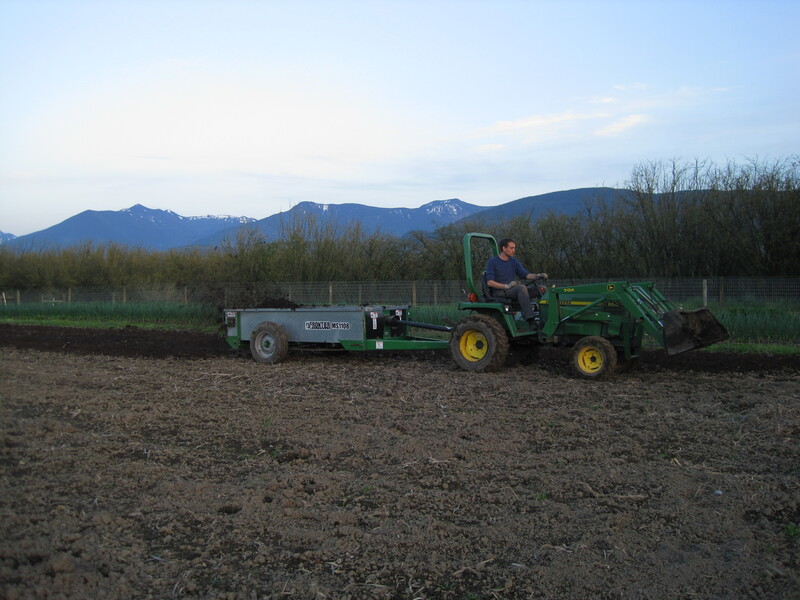 2010, just starting out farming in Abbotsford. 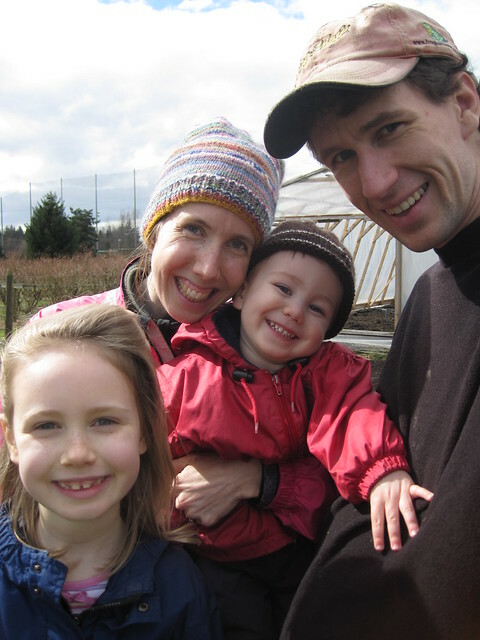 As Andy and I look back at our 10 years of farming (whoo-hoo! ), we’ve been considering the relationship between ourselves and those outside our family looking in. We rub shoulders with many people — family, friends, customers, acquaintances. Sometimes people look at what we are doing and say, “Oh, that’s really cool,” or give us some other encouraging comment. We also have well-meaning people express their doubts about our chosen line-of-work — or at least that’s how it sometimes comes across. “That must be hard. What a lot of work.” And some ask if we’re able to ‘make it’ financially. These people are often exploring the idea of becoming farmers themselves one day, and want to know what it’s like. We do think what we are doing is important – or “really cool,” necessary, meaningful. 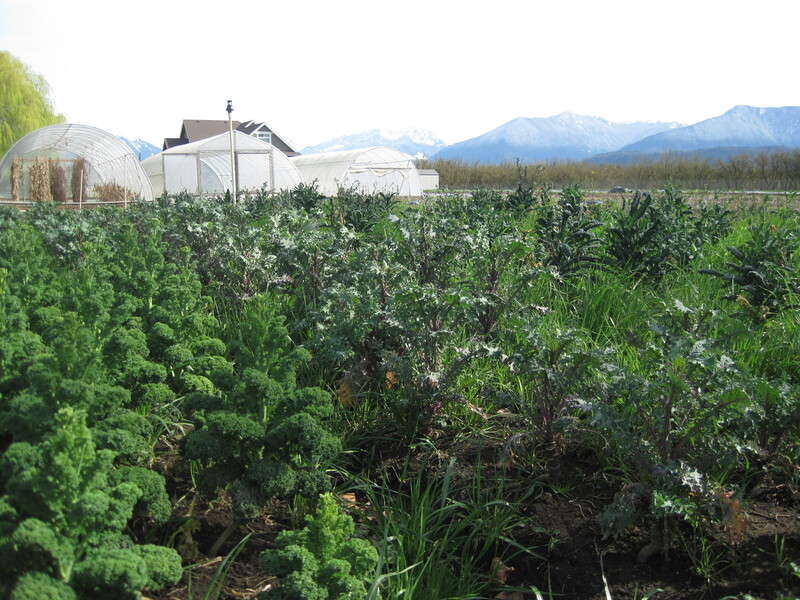 We are proud to be able to offer good (tasty) food that is grown responsibly. We’re growing without chemicals and with the health of the soil as a top priority. During these last 10 years we’ve also had time to try out different varieties of vegetables in search of the best tasting tomatoes, cucumbers or carrots, for example. With a lot of that work now behind us, we continue to focus on growing our favourite varieties — and have less and less space in the field growing trials. I have a couple people that thank me specifically for doing what we do when they shop at the our booth at the farmers market. This is very meaningful to me — but so is the person who quietly purchases their vegetables with a smile – and shows up, regularly or semi-regularly. I might know their name – or not – but I know their face — I recognize my market customers when I see them around town. Yes, small-scale vegetable farming is a lot of work and it’s hard too, often, and hot – often both. 🙂 But, it’s what we have chosen. Along with growing good food for our community and providing daily feasts for our family, we’ve chosen the uncertainty of the future. We don’t know when, if or how we’ll acquire land of our own. The variables of each season are constantly there – the wind, rain, heat and pest-pressure are a little different each year — as is our health, the number of people that come out to the farmers’ market or sign up for our CSA boxes. It may be naive, but the positive things that are happening as a result of us farming, seem to outweigh – at least for now – the security we might find in another line of work. I believe there are different perspectives and definitions when it comes to the word security, depending on whom you are speaking with. In most ways, yes, in others, not-so-much. We’ve been able to take care of our family and build our business a little bit better most years – with the help of a small community of family and friends, who’ve come alongside us in various ways. The not-so-much part of ‘making it’ financially refers mostly to us wondering how ending up on our own piece of land one day might work. We were thinking, lately, that – perhaps – it’s not just the farmers who are working hard, but it’s our customers as well. Our farm wouldn’t be around without our farmers market customers, CSA members, and restaurant clients. Yes, farming is hard work, but so is supporting a farm. We’ve had a few farm tours early in our farming career. It was very encouraging to have people show an interest through taking time to see where the food they eat is grown. Our customers support us through taking time on their Thursday afternoon or Saturday morning to find us at a local market. Our CSA customers pick up their surprise box of organic vegetables every Tuesday, often on their way home from work. There is a lot of effort being put out by our customers to connect with the food we grow. We don’t have a store – much less a store that is open from 8am till midnight. Schedules have to be flexed to purchase food from local farmers – at markets or at the CSA pickup. We are grateful for our customers – for the feedback, comments, encouraging emails, and for the simple (or not-so-simple) act of purchasing our vegetables. We acknowledge the hard work you put in to be an integral part of our small-scale vegetables farm. Please accept from us our hearty thanks! We’re looking forward to seeing you again in the Spring. Chilliwack and Abbotsford CSA Vegetable Box sign up is now open under the upper left “CSA Vegetable Box” menu at this website. Get your free range, organically-fed EGGS from the drink cooler at the House of James coffeeshop, 2743 Emerson St., Abbotsford. $6.50/dozen and support our kid’s egg business. Read more about reducing food miles and creating a sustainable table. Phew, 2018 was a challenge. I sprained my thumb early April and was advised to immobilize it for two weeks. I still tried to do all the work ahead of me – kinda difficult with my thumb in a splint! I ended up overcompensating and developed tendonitis in my opposite arm and shoulder. This resulted in me not being able to do any field work for two months (May and June). The picture below, from mid-June, shows the one thing I had no pain doing out in the field – picking raspberries for our freezer. Those ripe tender jewels slide off their white cores so easily! Andy was saddled with the all the field work while I did farm-related work that didn’t hurt my arm. I was really up-to-date on my paper work during those two months! While I went to physio and massage treatments, Andy put in extra reserves to finish filling the greenhouses and maintain crops that were already in. This enabled us to have as many summer crops as we did. We invested in some very helpful, yet costly, time-saving tools for seeding, planting and weed control this year. This was also part of what enabled us to accomplish what we did, even though I was injured. We had a handful of people reach out to us to help at the farm during this time – you know who you are – thank you! I also called on my father-in-law and my Dad to help me with the heavy lifting at the market set up. We were grateful for our children’s help, as well as a young lady, who came out to help us pack CSA boxes on Tuesdays. We built a new caterpillar tunnel in the spring, which enabled us to grow more tomatoes and cucumbers than ever before. We also got a new batch of laying hens in April. Our kids are in charge of the chicken related chores and are running the egg selling business mostly themselves (read till the end to see where you can buy the eggs right now, while we aren’t at markets). The market and CSA customers probably only noticed a lack of variety or presence at the market once Autumn hit. We were not able to keep up with fall plantings – which get put in during summer – and therefore had to end our season early. I feel like I’ve made a near complete recovery, and am still doing upper body strength training to support that recovery, with some of the specific physio exercises thrown in a couple times a week. In the fall and winter we took some time off as a family to rest and play together. We are not minding the mild winter at all. We’ve been taking down – one greenhouse at at time -the old tomato, cucumber, eggplant and pepper plants. Andy had a chance, during a dry spell, to make our annual compost pile with horse manure and straw. It is composting under a black silage tarp and will provide needed nutrients for our beds when it’s ready to use. The kids and I enjoyed a dry day to pick the last of the small beets for ourselves as well. So, now we look ahead. We’re entering our 11th season of farming this spring! We’ve been talking crops, CSA schedules and how to best tackle to the work ahead of us. We’re feeling good and are ready to face the year ahead. Thanks for joining us for the ride by finding us at a market, signing up for the weekly CSA Vegetable box or at least considering it (more on that in another post). Our hens roam freely in their spacious fenced area and greenhouse, in winter. They are fed certified organic feed and leftover vegetables. On Tuesdays we don’t harvest or sell any vegetables. This leaves the day open for farm work. It is a day I welcome. Now with the census, taxes and our CSA start-up paperwork off my plate, I can delve into what needs attention in the field. Today was broad forking, rescue-weeding shallots, planting zinnias and calendula and moving black plastic over areas of the field that have provided a first crop already. While working with Andy to haul a long stretch of plastic I discovered a handful of radishes that hadn’t been harvested – a surprise treat for me. On the home front, we got into town quick for groceries, collected a few things to thank teachers, read a bedtime story, froze some raspberries our eldest picked and kept up with the bare necessities of keeping a working kitchen. Shallots after weeding (on right) – yup, we were a little busy so we get behind on some stuff. 1. A friend and her family planted their first backyard garden this past summer. She showed me how they took a section of their lawn and began their first garden. They asked people around them for tips and then set to it. I was inspired, mid-summer, when she invited me to take a peek at their backyard bounty. As I looked at her tall kale and far-reaching cucumber plants, I was encouraged that they had taken some action to secure super-fresh vegetables for themselves. Her small children were seeing first hand what it takes to nourish yourself with some seeds, knowledge, work and a willingness to try something new. 2. Another person I was inspired by this summer was one of our CSA members, Barb. Barb is a senior who lives alone and signs up for our 7 pound weekly CSA box. She told me at the market one day as she recounted what she had processed, “I feel like I’m beating the system!” I totally loved that. Preserving your own food is an awesome way to ‘beat the system’ and eat local year-round. Some people don’t sign up for our box because they feel 7 pounds is too much for one person (or more). However, summer is the perfect time to preserve. A freezer, some basic equipment, a willingness to put in the time and a few learnable skills are the main things needed to eat more local food in the winter. Even if you pick just one vegetable to preserve this summer, that is one more local veg that you get to enjoy come winter. You are making a difference for yourself, your family and the environment too. This year we tried to store away more than other years too – it is a challenge with time, for sure, but we got some green beans and tomato sauce, ketchup, relishes and pickles put away – either frozen or canned. When the bounty of the summer is upon us, consider what you can put away for the colder months. Ask us or other farmers what kind of bulk discounts they can give. If people start buying vegetables in quantity (10 pounds or more), we will happily need to bring more to the market. Placing an order or inquiring a few days in advance is always helpful. In the freezer: green beans, broccoli (need blanching), roasted peppers, shredded zucchini (good for baking), kale and spinach. Canning: ketchup, relishes, pickles (beans, zucchini, beets etc. ), jam and fruit sauce. Potatoes: can store for months in the winter – somewhere cool, if possible, and dark (not the fridge). I hope you are encouraged in your local food pursuits and inspired to preserve at least one type of vegetable this summer. Look up some recipes and make some plans in the coming weeks, because before you know it, your market and/or CSA box will be full of delicious treats you are going to want to enjoy in the winter too! I just wanted to touch base on the topic of our 2015 year, before we release our plans for our 2016 year. Looking back on my last few posts I see a spring-posting trend. Mid-summer I have lots of reflections and thoughts while working in the field but don’t feel I have time to pen them once I’m done training cucumbers or weeding carrot beds – tasks that allow my mind to sift and sort all the action of my days. We just set up our Twitter account and hope that is a good way for us to stay in touch with you as well, a few words at a time (find us on Twitter at abundantacre@familyfarmm). This summer was certainly hot – a bumper year for tomatoes, cucumbers and watermelon. We sure did enjoy the different varieties of watermelon we tried and were super-thankful for this refreshing treat. Summer CSA harvest days would find us out early harvesting greens before they wilted and then quickly tucking them away into the root cellar to stay as cool as possible. Andy was kept busy monitoring and moving irrigation lines to make sure our vegetables got the water they needed. We would water ourselves on particularly hot days when we had no choice but to continue on despite the heat. A wet head clears the heat-dazed mind slightly. We started at the Abbotsford Farm & Country Market in April this past year and were there almost weekly till mid-November. Having our 10 year old daughter helping out there most days was a treat. She also learned some on-farm work this year like seeding and transplanting. It was fun to discover that our 5 year old son could also transplant with his trowel. I remember a couple spring days we were pushing to get cabbages in and we were all out there planting together. Thank you to the volunteers who came out to our Potluck & Pitch In evenings in May and June. It was great to share a meal and work together. Thank you to our regular volunteers Dad A., Lee and Amy for your time and enthusiasm about what we do here. We made 70 CSA boxes weekly for members in Chiliwack and Abbotsford, from mid-June till mid-September. Our Autumn box served a total of 45 weekly families and ran from the middle of September to the middle of November. We were happy to partner with two local restaurants again this year and provide them with a weekly CSA box as well. Restaurant 62 and Seasonal 56’s creative chefs worked with our weekly surprise box of vegetables with eager hands and an appreciation for quality vegetables grown locally. I was told many of our cucumbers were turned into pickles, in Aldergrove, at Seasonal 56. We are thankful for your support this past year and look forward to the coming year. We hope to serve you better, through our CSA and at the market! Registration for our 2016 CSA will open later this week…stay tuned. I planted this kale last summer – sneaking out in the quiet of the morning to get it in. It was the second batch of kale we planted. Summer plantings are always a challenge, with the harvesting, CSA, market days and maintenance of other crops that is going on. I remember thinking, “Are we getting this in too late? Will it mature?” It did. Our autumn CSA members got crisp, deep green baby kale. Winter came and the kale stalled off and stopped growing. I did buy a few bunches of carefully selected kale for our family from grocery stores in December and January – that felt funny, but when the body craves green, it craves green. Spring weather came early this year and with longer days, comes growth. The kale begins to grow again – the collards too. The collards had taken a hard hit by flea beetles last summer, so we never harvested them for market – maybe we did, but just once. This spring, there they were, in all their healthy-proper-collard-looking-glory. Spring is when we feast on kale sprouts (aka shoots). The once-every-other-day mini-harvest for our family is good for body and soul. Being in the field again is refreshing. The broccoli-like shoots are tender, as are the new kale leaves. The kids snap their outdoor kale shoot snack off the plants while outside. Inside, they enjoy them with our favourite homemade miso dip (see the “Eating” page) and adults around here eat mounds of kale shoot salad (apples, nuts and miso dressing, raisins too if you have them). If we’re cooking kale shoots, it’s usually as a side dish. We saute them with garlic or shallots, salt and a splash of red wine vinegar – so good! So, this kale, that required such a special output of energy to plant, has totally been worth it. 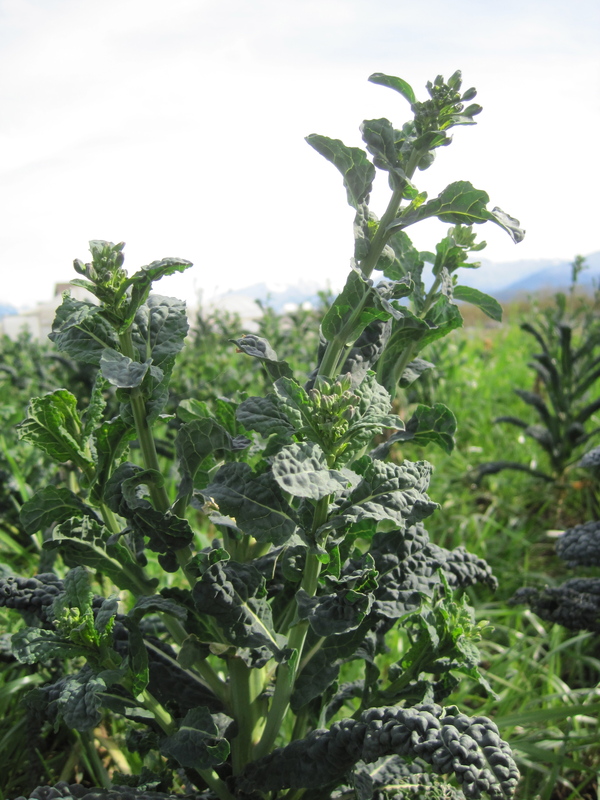 This kale, that I put in while feeling the morning’s sun strength increase, has given and nourished and given again. You see, after you harvest a shoot, another grows – albeit smaller and a little tougher. The harvest of kale shoots is a couple months long. We don’t want the plants to flower and go to seed. The Black Magic kale flowered before the rest, so Andy brought those plants to the hens for th em to enjoy. They love their greens! When the plant is first flowering, the flowers are sweet – the kids discovered this. I always avoided harvesting the flowers because they represented what we didn’t want to happen (making seed). But after the sweet flower discovery, I would make sure to harvest some flowers for the kids for lunch or snack time. When I sat down to start this post Andy was tilling and I had just transplanted cabbage seedlings into one of our hoophouses. Our children were watching our landlord make a trench so we can have power brought to our outbuilding permanently. I often marvel at the changing face of the farm come spring. In one day, we move a greenhouse on its handy track system, take out kale plants and prepare beds. On other days there is the grand shuffle of trays of seedlings from the germination room to the nursery greenhouse, while more mature seedlings get transplanted. The longer days bring growth. The remaining kale and collards bud and then flower. They will be removed soon to make room for different crops. We need to manage the growth of grass and weeds as well. We’ve thinned and weeded beets and carrots and have moved our big greenhouse for a second time — off of the lettuce it gave a head start to for a month. That greenhouse will be the home to some of our tomatoes and peppers down the road. The rhubarb we put in just last year has brought us a great crop of long, thick stalks. I do enjoy spring at the farm very much. There is a lot of good work to be done but the pace is more relaxed than when we are selling vegetables four times a week, like we will be in the summer. The nursery greenhouse is bursting and seeing the seedlings mature is almost magical for me. I am involved in a lot of the seeding and then it is Andy who waters the soil blocks daily and sees the gradual growth. Sometimes I’ll seed a vegetable and then not see it again till it’s time to transplant. “Oh yes, I remember you,” I think. The other day Andy and I were talking about values and how that which is seen can often be given a lot of importance. People naturally care about what they can see. That got me thinking about our farm and how we very much care for the often unseen or unconsidered things — like soil microbes, earthworms, birds and animals that call the area in which we farm home. We care to build up the soil so that this particular piece of the planet can be nourished, and people in our area can have good, clean, flavourful, nutrient-rich vegetables grown organically by farmers just down the road. We’ve been focusing, this winter and spring, on building up our compost supply. We bought a manure spreader in order to make the jobs of transporting manure and turning our compost pile more manageable. 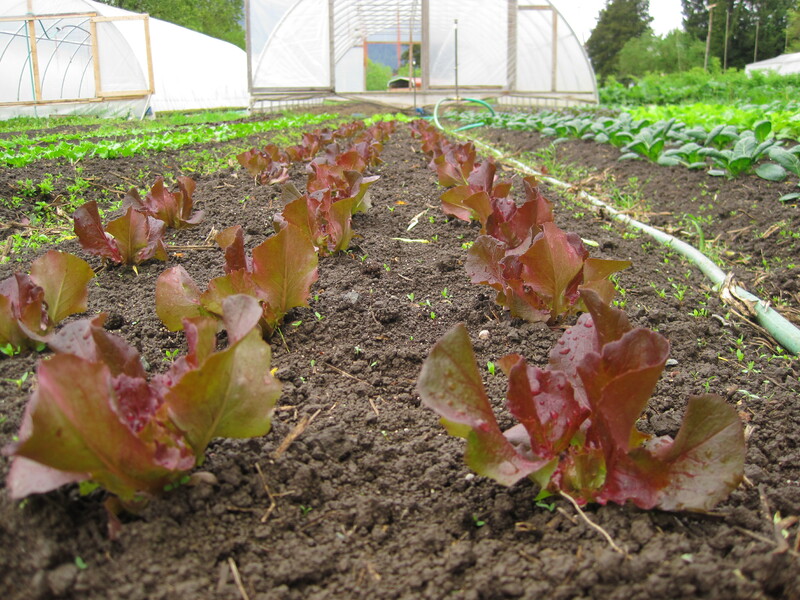 We recognize the need to feed the soil that will nourish the vegetables that sustain us. 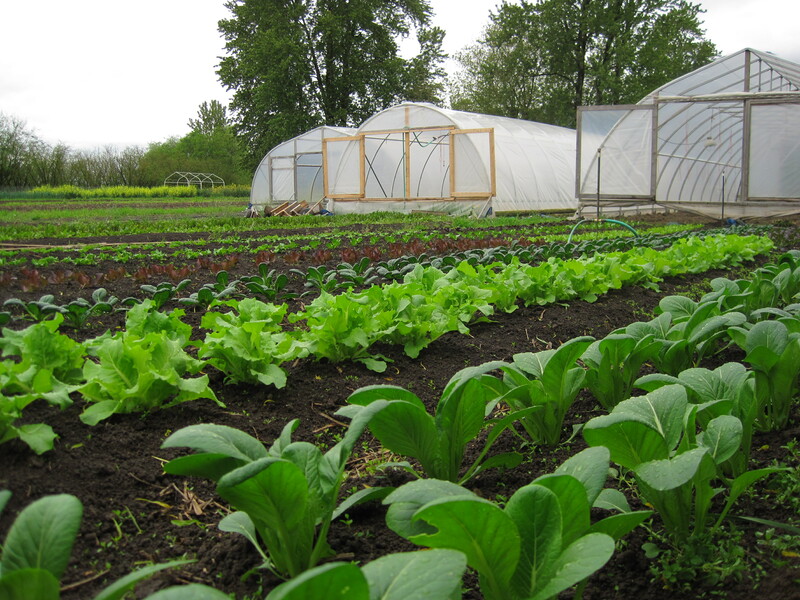 People from the Abbotsford and Chilliwack area have been signing up for our CSA this spring. 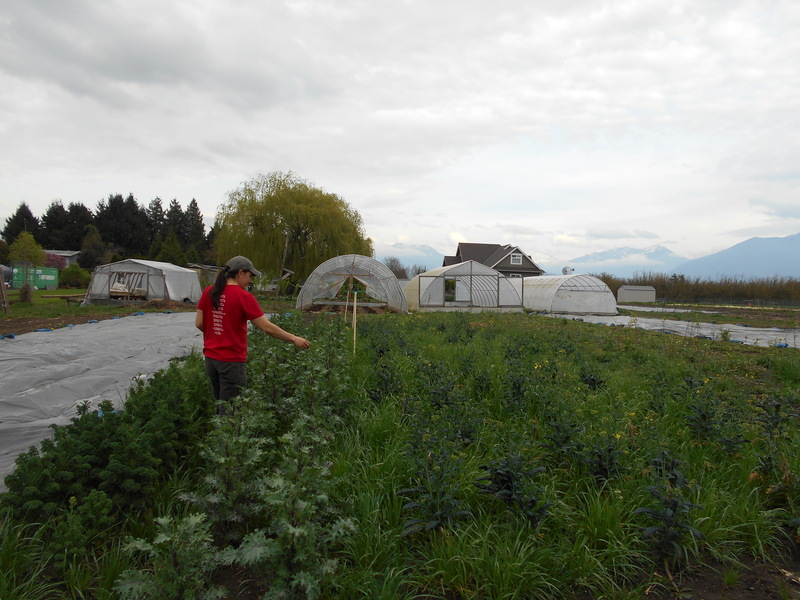 There are a lot of things – both seen and unseen – that are happening when you decide to sign up for a Community Supported Agriculture program. -The cash you put in the farmer’s hand in exchange for super fresh vegetables. -Unique vegetables you get the chance to try, learn about and quite likely come to love. -You have the unique opportunity to get to know and ask questions of the people who grew your food. 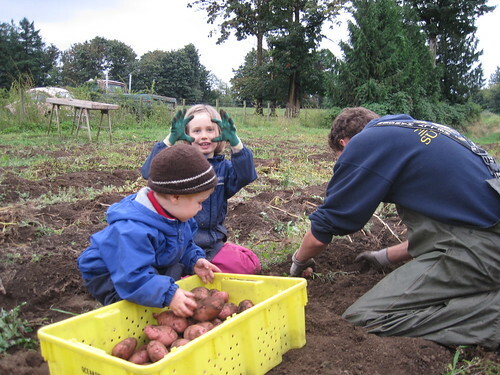 –Your membership supports and encourages a local farming family. In British Columbia, more than 50% of farmers are aged 59 and up with less than 5% 34 and younger. * The few farms in our area offering CSAs, that we know about, are run by people in their thirties that seem to be into farming for the long haul. Supporting younger farmers helps secure the availability of the food they grow. -You contribute to the health of our planet. You participate less in an oil-fueled food system that relies on shipping produce from all over the world. We’re trying to keep things as local as possible and currently sell our vegetables within about 40 kilometers of the farm. -Your hard-earned cash is funneled into your local economy rather than out of it. If you sign up for our CSA, you support farmers who make purchasing decisions based on buying local, ethical, and fair trade when possible. So, thanks for your ear. Thanks also for your interest and support of the seen and unseen when it comes to food choices — wherever you may be on that journey. *according to the Fraser Basin Council’s 2010 Sustainability Snapshot.